Della Pasqua yard is now renewing its production range and the deeply redesigned boats are characterized by the "S" monogram. For G. Carlo and Mirco Della Pasqua, the target was to give new emotions and opportunities to yachtsmen. Testing the new DC 10 S and noticing its features together with the price/quality ratio, the impression is that the goal has been surely achieved. It has always been in the yard's philosophy to design and build fast and reliable boats with comfortable lay-outs and an interesting price, if compared to the product's quality. In fact the tested DC 10 S confirm this theory and features even more accurate details and elegant interiors without disregarding rational solutions. Privacy and comfort are ensured by two cabins, each with a private bathroom. 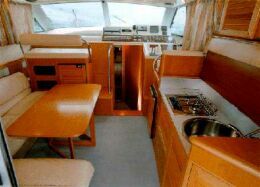 The saloon, with a spacious dinette and bar, is comfortably rich with a fully hidden kitchen on the starboard side; the steering area includes an excellent chart table. Outside the DC 10 S features a roomy flying-bridge with a comfortable steering position and reliable fittings. The teak lined cockpit is very spacious and a comfortable sun-lounge is located on the fore deck. Seakeepness is ensured by the Hunt hull, first used on Della Pasqua boats 37 years ago. Thanks to a so widely tested hull the new DC 10 S achieve excellent performances (with no more than 660 installed HP) and ensure a stable and soft ride. The result is a very well balanced boat extremely spacious and performing: by introducing the new DC 10 S the Della Pasqua yard will definitely satisfy all its uncounted fans. Average miles range, at a given rpm, is obtained dividing the total fuel capacity (800 liters) for the "liters/mile" corresponding to the entered rpm. Plotted fuel consumption is declared by the engines' manufacturer: tuning of the engines, weight of persons, stores, etc... on board, hull conditions and propeller type can effect the real fuel consumption. Deck and particulars material: fiberglass - balsa core sandwich construction. Fore deck: bow beak, handrail, windlass, anchor and chain, fenders holder, sun-lounge cushions, hatch, cleats and fairleads. Cockpit particulars: perimeter settee with storage underneath, teak lined deck, davits, shower, cleats and fairleads, flying-bridge access ladder. Swimming platform particulars: fiberglass built, teak lined, ladder, inflatable storage compartment. Superstructure windows material: toughened glass . Flying-bridge particulars: radar arch, handrail, Plexiglas windshield, second steering station, compass, pilot and co-pilot seats with lockers underneath, sun-lounge. Lay-out and main features: bow owner's cabin with double bed, two wardrobe, en-suite bathroom with fabric ceiling and marble top, guest cabin with twin beds and wardrobe, separate guest's bathroom, fully hidden galley, steering station, pilot and co-pilot seats, chart table, custom upholsters, fitted carpets, bright cabinet work. Steering station: hydraulic steering (wheel type), compass, depth sounder, complete engine instruments and gauges set, LOG, hours-counter. 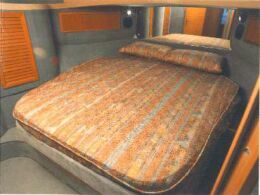 Chart table: to the port side including a 3 persons settee and the chart holder. Galley: to the starboard side, with two sinks, working top, 3 burners stove, 75 liters refrigerator, lockers. Standard equipment: battery switch (parallel option available), boiler, flying-bridge search-light, flying-bridge tarpaulin, 3 batteries, bronze rudders.